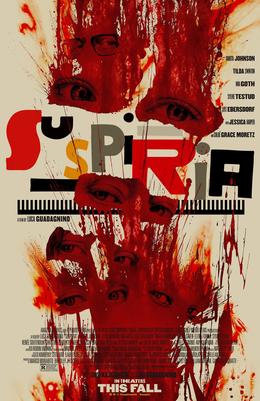 A remake (or a reimagining as it’s been billed) of Dario Argento’s seminal horror, ‘Suspiria’ is a surreal trip into a dance school in 1970s Berlin that acts as a cover for a witches coven. It comes from Luca Guadagnino, whose recent films were the superb ‘Call Me By Your Name’ and ‘A Bigger Splash’, and as an Italian filmmaker he is well aware of the reverence in which his compatriot Argento’s film is held. His choice in this version is to go bigger and bolder, expanding the scope of the narrative both in length and themes, whilst retaining the core components of the 1977 film and it’s a film that will stick with me even as I’m not sure if I really enjoyed it or not! Our viewpoint into this world is Susie Bannion (Dakota Johnson), a talented young American who moves to Berlin after being accepted at the Markos Dance Academy. Around the same time a student has gone missing from the academy, drawing the attention of a local psychotherapist, Josef Klemperer, who starts to become suspicious of the academy. Unlike the lurid, exaggerated use of colours in the original, Guadagnino uses a darker palette, all the more to enhance the bleakness of the time period and the setting. His narrative delves into the legacy of the Second World War (not altogether successfully) through Klemperer, as well as themes of motherhood and femininity with the individuals at the dance school itself. I liked the dance sequences, particularly a climactic sequence towards the end that acts as a centrepiece in the narrative as well as a thrillingly choreographed piece of work, and Thom Yorke’s debut film score is an entrancing piece of music. The film is 152 minutes long and I found myself completely absorbed by the imagery, even as I struggled to keep up or maintain interest in the actual narrative. In that sense, ‘Suspiria’ was quite a curious experience for me, and I was particularly surprised at how moving I found the conclusion to Klemperer’s story to be, not least because he was played by the imperious Tilda Swinton in heavy prosthetics. Swinton plays three roles across the film and is as good as ever, but I thought Johnson was excellent, showing more depth than perhaps she’s had the opportunity to show in prior movies. I wouldn’t say I liked ‘Suspiria’, but it certainly captivated me and I’m glad I found the time to watch it.